There are many benefits of executive suites Toronto that companies of all sizes are now realizing. The top reasons companies look at renting executive office suites instead of leasing a traditional office is to better manage costs and control budgets. Some companies utilize executive suites as a way of reducing the amount of capital spent on leasing traditional office space and keeping it equipped with modern business machines and furniture, thus allowing them to grow their business without the hassles of managing an office. Here are some examples why some companies enjoy the benefits of executive suites Toronto. Company A is a fair sized U.S.-Based company that had just started moving into the Canadian market before the slump in the U.S. economy struck. Their Canadian staff contingent was 25 and 7 of those employees were in support staff roles, 13 were customer support and the remaining 5 were sales and management. The company outsourced its Canadian customer support to a firm in New Brunswick (a bilingual province) and were able to reduce the remaining staff to 7 people. They no longer needed their larger office space and found that the benefits of executive suites Toronto would outweigh leasing another traditional office space. They were able to utilize a team space that easily accommodated them all. Company B is a medium to large corporation that has a large office space in a Toronto suburb, but they needed some short term office space to house a consulting team for a 6-month project in the downtown core. After only 3 months, they decided to move a few of the company’s sales executives to the same location. 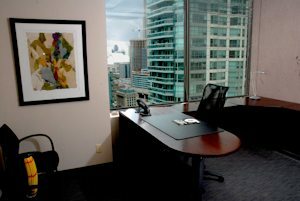 The benefits of executive suites Toronto to this client was having an office space Toronto for key staff members who dealt with corporate customers in downtown Toronto. Company C is a business that started in the owner’s garage and was starting to build its professional reputation. They did not want to take the leap and lease a downtown Toronto office space until they were certain they could sustain the business, but they also did not want their customers to see them as unprofessional by having an office in a home garage. They rented a semi-private office in an executive suites Toronto business centre, so they could have their calls answered by a professional receptionist that made them sound bigger than they were, without having to pay the salary of an additional employee. Many people that work part-time out of their homes will often lease out an executive suite to have a prestigious business address. Company D is a new U.S. communications company that was just given regulatory permission to set up its service in Canada. They needed immediate office space Toronto for 50 employees. Within 18 months they had expanded their business so much that they outgrew the executive suites Toronto and needed to find a larger consolidated office space. The benefits of executive suites Toronto to this company was they were able to move in quickly and get down to business. Another one of the benefits of executive suites Toronto was they were not tied into a long term lease when it came time to expand. There are many other reasons why companies use executive suites Toronto instead of leasing a traditional office. Typically, they lease a Toronto executive office suite in order to make a good impression on clients. This is a great way to also have a local address for businesses that run on the Internet, but that do not occupy the office frequently. In addition, the benefits of executive suites Toronto is they will include conference room use, a receptionist that receives guests and takes messages, office equipment use, mail forward service, and many other features. There is no investment that is required up front for business machines like photocopiers or faxes, Internet, or even furniture. Most executive office suites are often referred to as an instant office, giving a company prestige and comfort for however long they need it. Lastly, the benefits of executive suites Toronto extended to companies in the middle of moving into a new building that is not ready, by offering you a flexible, temporary place to call home. When your permanent office space is ready, you just pick up and move yourself – you do not have to worry about moving furniture or any business equipment.